UPPER WEST SIDE — Rent-stabilized tenants living in a mixed-income building are being shut out of using the complex's new gym reserved for market-rate residents — and now they're pushing back. 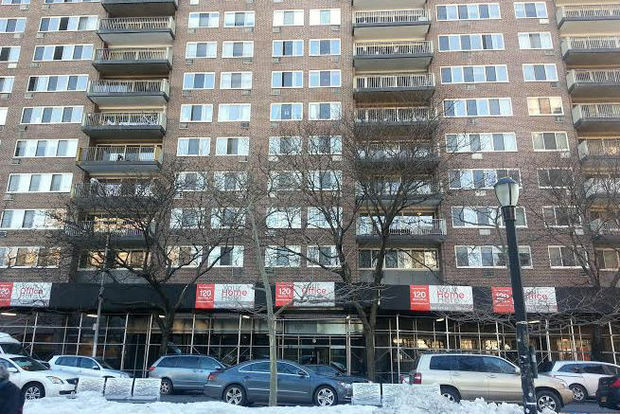 In mid-February, the management company for Stonehenge Village on West 97th Street between Amsterdam and Columbus avenues announced that access to a new lobby-level exercise room would be limited to market-rate tenants, resident Danny Perry said. "The rest of the tenants, who are rent-stabilized and represent the majority of tenants, are forbidden from using the facility," he said, a fact confirmed by Stonehenge. Rent-stabilized tenants, who Perry and other residents say make up at least 60 percent of those living in the building's 417 units, were told of the decision when they asked about use of the new gym at a tenants' association meeting last week, he said. "It’s segregation," said Perry, a longtime resident. A sign on the gym's door proclaimed that not all residents are authorized to use the gym and not to hold doors for other residents. Non-market-rate tenants said their key cards don't allow them in to the locked room. Rent-stabilized tenants were furious when they learned they were barred entry, said tenants association president Jean Dorsey. "I had to defuse a really potentially ugly situation," she said of the meeting, adding that the association intends to fight back. "I can’t let you make me a second-class citizen within my own building." Dorsey has lived in the building, which was formerly designated as Mitchell-Lama housing, for 40 years. An agreement between the management company and the tenants was signed in 2006 to maintain existing occupied rent-stabilized units, she said. Dorsey's un-renovated two-bedroom apartment with a terrace costs about $1,000 a month, while her neighbor across the hall with the same layout pays more than $3,000 a month, she said. Dorsey said the situation at the small gym, which she estimated is about 15 feet by 20 feet, hasn't provoked problems among neighbors — just animosity toward the management company. A spokeswoman for Stonehenge Village said the company has invested $5 million towards upgrades to the common area used by all tenants. "The small gym we built and opened this week is different in that it is aimed specifically at new and prospective tenants who expect certain amenities and incentives that are commonly available to market-rate renters," said spokeswoman Marcia Horowitz, adding that the building needs to attract market-rate residents to survive financially. "Our goal at Stonehenge Village is to provide a well-managed, high-quality building for all our tenants." Perry said the lack of transparency in the opening of the gym also irked tenants. When he saw the gym under construction, he emailed the company to see what the rules would be, whether there would be a fee and the rules around bringing friends, he said. But he never got a response. "They did it without thinking about the backlash," Perry said.